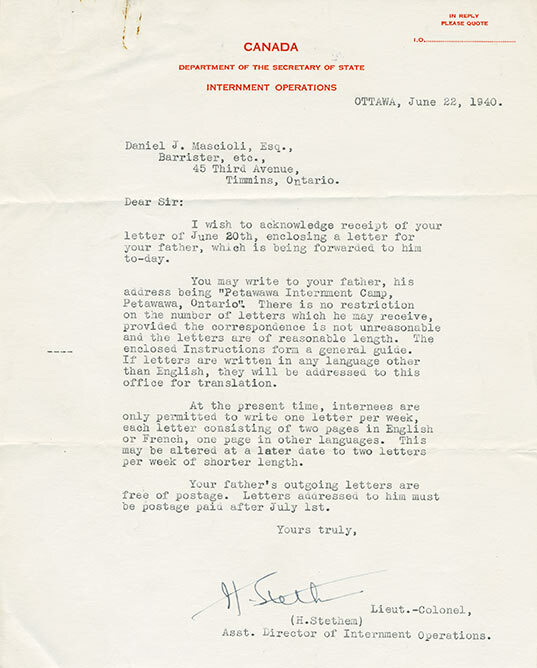 This is a typewritten one page letter from Lieut.-Colonel H. Stethem to Daniel Mascioli, dated June 22, 1940. Daniel is the son of Leopoldo (Leo) Mascioli and nephew of Antonio (Tony) Mascioli, both interned at Camp Petawawa during World War II. Also enclosed is a one page typewritten Instructions form, meant as a general guide to families when writing to an interned family member. Stethem informs Daniel that he has received his letter to his father, and that it has been forwarded to the camp. Stethem also explains to Daniel that there is no restriction to the amount of letters that his father can receive, "provided that the correspondence is not unreasonable and the letters are of reasonable length." Further, that any letters written in another language other than English will be sent to Ottawa to the Department of the Secretary of State, Internment Operations, for translation. The internees were allowed to write one letter a week, of up to two pages for letters written in English and French, and one page for those in Italian. Internees' outgoing letters were free of postage. 1) Letters must be written in either English, French or German and Italian and limited to a reasonable number. 5) Letters must not contain drawings, pictures, shorthand, music, unintelligible signs or marks and all surnames referred to must be written in full. The use of abbreviations, odd letters or unnecessary figures is prohibited. 11) Letters must not contain any reference to the operations of war nor economic nor political situation. Prohibited items were also listed such as fountain pens, ink, writing paper, notebooks, candles, inflammable materials, cigarette papers or pharmaceutical products.